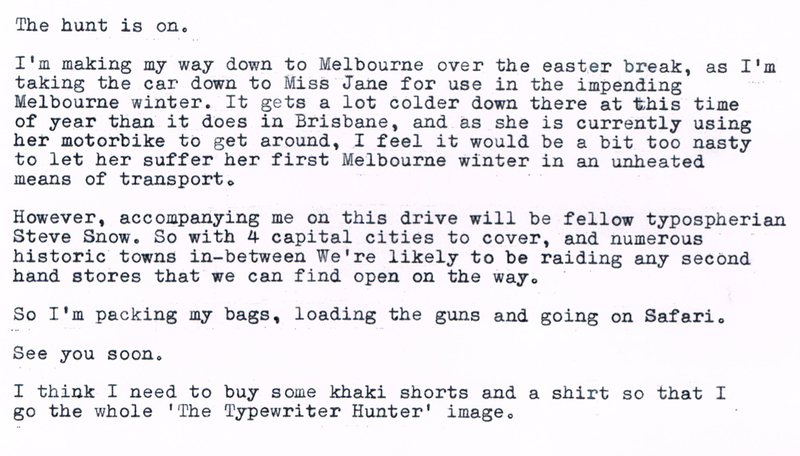 April 16, 2014 in brisbane, Canberra, driving, hunting, melbourne, Sydney, typecast, typewriter, X Trail. ← The blogs that could have been, never were, or are yet to be. 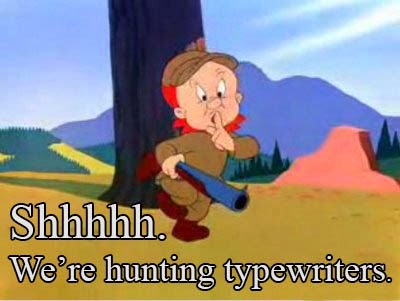 If Elmer Fudd says it, shouldn't it be 'typewiters'? Melbourne's running a little cool these days, Scott, so be sure to pack a scarf. Good point! He probably would. And thanks for reminding me. Packing scarf now! Thanks. Let's see if I can turn up a Sphinx. I wish there was something exotic! But… We'll see. Thanks good sir! Actually, I just had a wack idea… (been reading up on the VOC and the Dutch traders who sparked the Golden Age of Holland in the 17th century…) – since this is an exploratory trip/safari/expedition, with a focus on marketable goods, why not set up a basic-shareholder type of arrangement… like for instance, investors buy a share in the venture (say $10 ) and up, and that helps fund the purchases you find & make along the way, pays for petrol etc. And when you come back, laden with tasty typers of all colour and hue, you share the spoils with the investors? I know, the return on investment won't be huge… but still, crowdfunding and all that? Or, for a small share contribution, you pool the funds and raffle off the fanciest/best typer to one lucky winner. Just thinking… wack. Or… you could just hop in the car with them en enjoy the fun of the hunt! I know, crazy right? And remember, if the hunt isn't that fortunate as you wish, there will be a nice Gabrielle waiting for you when you return.